Well I got through it! I know you’ve probably all been waiting for me to write this for a couple of days and I really am going to have to get better at writing this report straight after the event. In short, I was kinda knocked for 6 by running in the middle of the night, having a couple of New Years beers after and trying to sleep for a couple of hours in the day. The race itself was pretty crazy. It was a little difficult to get to and we only got there 10 minutes before midnight. I’ll take full blame for that, as I was nervously trying to collect myself before we left the hostel and it made us run a little late. My lovely sister Alexis was with us from London, giving up her New Years to come and hang out in the cold and cheer us on. After a couple of beers in the evening Daz was full of dutch courage, so he signed up for the 10km run when we got there. The atmosphere was really good at the sports hall where the marathon was being held. Most people there were participating in one of the events – the 10km, 21 or full marathon. The organisers have been clever in having the race begin inside the sports hall and it finishes there also. You actually run right into the hall to cross the line. I managed a quick toilet stop right before we started, with nerves always being an issue for me at the start of any race. This meant that I was pulling my belt around my waist as they started counting down to the beginning of the run. This doubled as the countdown to New Years too, so it was kinda surreal to see everyone crowding to the entrance of the hall waiting to dash out into the cold night air in celebration of the beginning of 2010! The Swiss were pretty well wrapped up too. Everyone was wearing plenty of layers, including track jackets, beanies and gloves. I was a little less prepared, as I couldn’t imagine running in such cold temperatures, so I just donned my Skins to keep me warm and put my super cool Runlikecrazy running gear over the top. Couldn’t let the opportunity to advertise my little adventure be covered by a jacket! Though maybe I should have, as really, there was no one out there to see it. A few brave souls clustered near the beginning and at various check points along the way. As each hour passed, the groups dissipated though, as the cold inevitably seeped through their defenses. The course itself follows a trail along the river Limmat which runs through Zurich. You leave the sports hall and head to the river, where you begin a long 10km loop, 4km out, around 5km along the other side and then 1km back to the start. Each loop took me about 55 minutes. This was pretty much on pace and as soon as I started I seemed to be passing people. Actually, I seemed to be passing people for the entire race! Loads of runners must have gone out pretty hard, because as I wore through each lap I seemed to pick up more places. 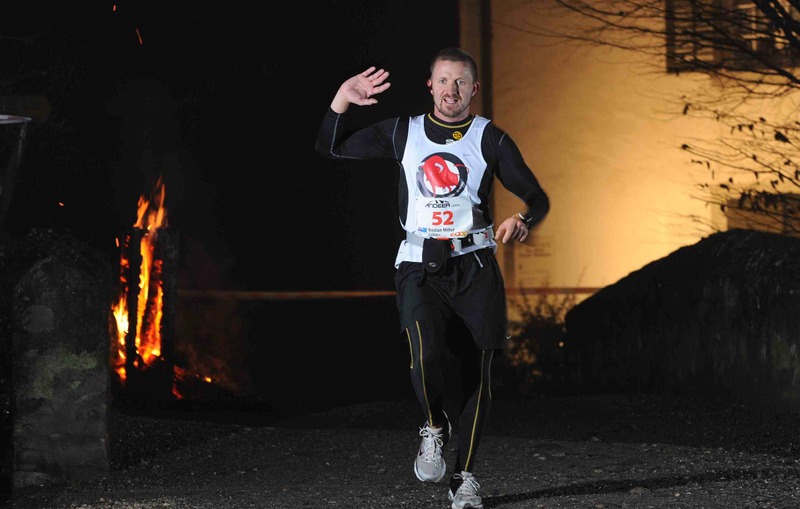 Most runners had a head torch to guide them. But it was a beautiful full moon and although there was a lot of fog about, there was plenty of natural light to guide your way. Actually, I don’t really like running with a torch. I think you tend to focus on that one spot that is being lit in front of you and you lose the sense of where you are. I mean, I was running along a Swiss river in the middle of the night on New Years Eve for Pete’s sake! And there were fireworks going off every few seconds on the horizon. That was a scene you wanted to take stock of for as much of the run as possible. So there I was with fireworks booming like canon fire in the misty night sky. The fireworks were pretty heavy to begin with, but slowed down after about half an hour. Strangely though, they continued for the entire time I was running. It seems that everyone in Switzerland has a stock of boom sticks to let off through the whole night. I don’t think it’s very coordinated, but it did seem like the percussion was bouncing from one side of the valley to the other, like neighbours communicating their excitement through explosions of sound and colour, trying to outdo each other. I felt good for the entire run. My old adductor strain gave me a couple of pinches, tightening up a few times through the distance. I slowed to a walk at the drink stations and that seemed to loosen it up. In fact, the drink stations were very cool, with volunteers cheering you on as they dished out cups of heated, almost hot, water and sports drink (ISO as the called it). The stations were lit by burning logs and the volunteers must really have been freezing by the time 3 and 4am came around. It could have been colder though, sitting at about 2 degrees C. There was no rain or snow, which apparently there normally is. It was still kinda dicey running on a trail next to a river in the middle of a cold winter’s night. I later said to my father that I probably couldn’t have picked a more dangerous run to start off with. But that last lap just felt good. I had left a lovely Italian bloke behind on lap 3. We’d been chatting about life and how great running is. Gianfranco was telling me how he needs running to keep him focussed and fit for his two baby sons. The eldest was so quick now that chasing him was all the training he needed. As I left him in the mist and charged on to finish my first run, I found myself running by myself along a crest, not able to see more than 20 meters forward and nothing behind. Right there, I realised, was the moment I’d been hoping for – a moment of clarity where it was just me running against the world, by myself in the Swiss night, with only about 6km to go. I was really here, really running around the world. My little dream was now an actual adventure! I loved that moment and hope to have many more. It pumped me up and I started storming home, passing struggling runners in their own world of pain, singing “Guten Morgen” as I trundled by. I turned off and ran into the hall. I was busy trying to talk to my camera as I ran in, but there was Alexis cheering for me and Daz with the other camera going. They were even talking about my challenge as I ran across the line. I’d completed it in 3:42.32. No PB, but it was the best result I could have asked for given the conditions. It had been a rushed start, but in the end a weird and wonderful run. They even had awards for the fastest athlete from each country, so being the only Australian, I cleaned up. Roger Kaufmann, the race organiser, is a bright eyed gentleman who I managed to meet after the run. He’s a mathematician and had actually given me bib number 52 as a little joke. The event he has put on is really fantastic and I would recommend it to anyone that wants a different way to start their year. Roger’s participant numbers have been steadily doubling on a yearly basis, so by the time you get there, this will be a very big event! Daz knocked off his 10kms in 55.51, which I think is a top effort. He was even winner of fastest Kiwi! Well done Daz. And thanks again to my beautiful sister Alexis for coming all the way from London to spend a few days. I got a lotta love for you Sis. Marathon 1, tick. Marathon 2 is Tiberias, Israel, in just a few days. great time as well, Now time to tackle the worlds lowest marathon, Tiberias! 200m belw sea level, could be a quick one! Well done Tristan. Every (long) journey begins with a single Marathon. Or something like that. 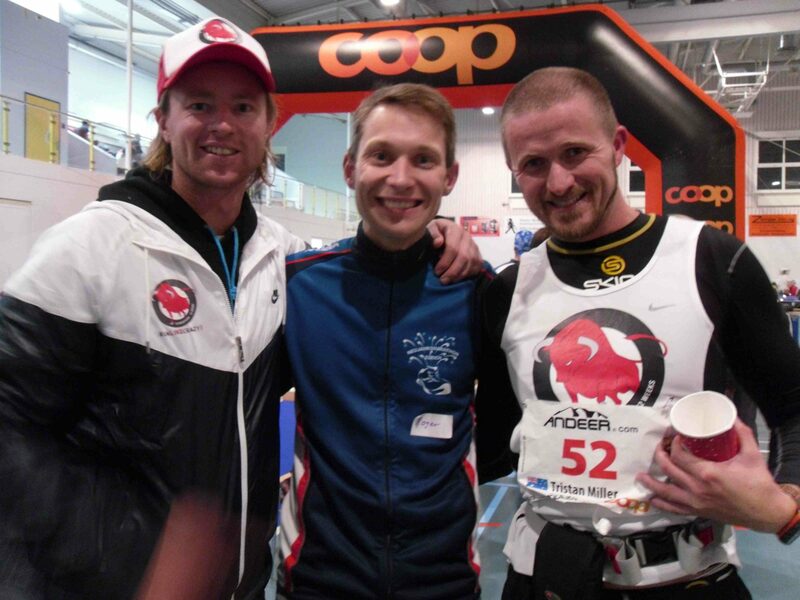 Congrats on your award for the 1st Australian to complete the Zurich marathon. “Straight to the pool room”. Keep up the great work. Darren. Well done! Loved your Race Report too. Sounds like a great way to kick off a year of marathons. Good luck with backing up. Brilliant mate congratulations. I just read your first Marathon and I’m in awe…..
Good work buddy!! 1 down. Happy New Year! I am very proud of you! What an inspiring way to start 2010! Take care of yourself!!! By the way, we celebrated NYE with the HOF, I love it! great work T-bag, love the commentary, keep it coming. Great start mate, looking forward to reading each week as you progress. Great work Tristan! I noticed your race number in the first photo and wondered whether it was just coincidence… got to love Roger’s sense of occasion. Awesome! Congratulations, what a feat to run in such cold weather! Love reading your write-up – keep it coming! Proud of you to be the FIRST Australian to take up this challenge!!! Congrats, loved the write up, just fantastic to go thru the run with you and your thoughts. A wonderful diary – the start of your book! Number 52 – very clever of that man to give you that! Cant wait till the next run – good luck!! I think that T-Bone steak was medium rare; a cracking start to the episodic journey my friend! I wish you many more moments of rush hour like at the 6kms to go point. I can’t wait for chapter 2; get amongst it! Awesome boys …keep up the good work …focus 51 to go ! Congrats, one down! Awesome race report, look forward to 51 to follow. All the best, you’re a bloody legend. Keep those legs pumping mate! Congrats Tris, what a way to start! And not only can you run, it appears you can also write (and not just radio commercials)! I completely got lost reading your words then…I feel a book coming on!!! Hi Tristan. Thanks for the great report. Whish you all the best for the upcoming races. 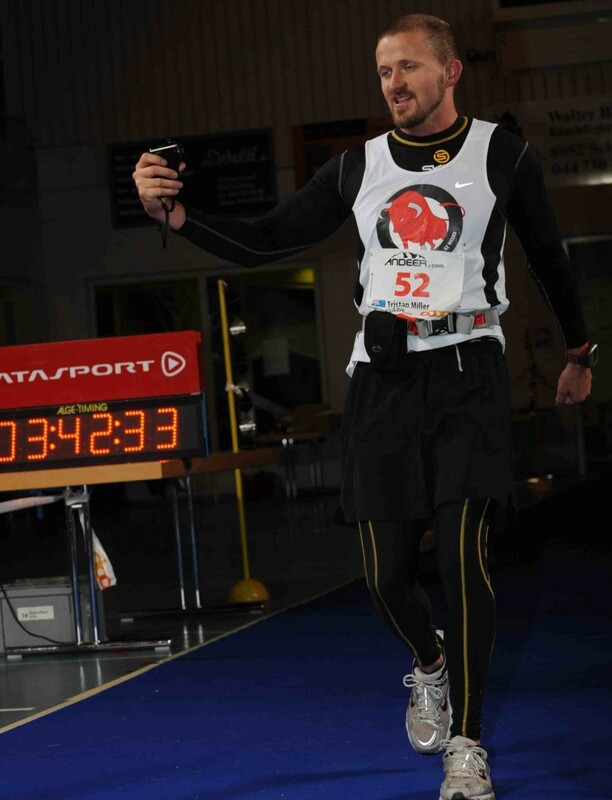 Was a pleasure to have you with us @ Neujahrsmarathon in Zurich.